Anita Rose is still looking for this bear. 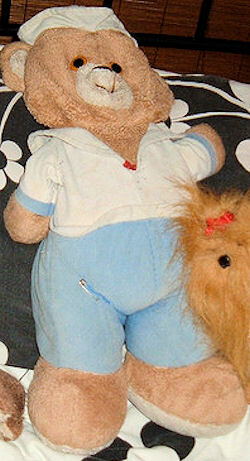 I’ve had this sailor bear that my parents bought at a thrift store since the early 1990s. As you can see in the photo, he’s pretty rough looking. I am looking for a duplicate of him, but unfortunately I’ve forgotten the name of the manufacturer, and his tag has fallen off of him years ago. Oh, he also had a red ribbon on his chest with tiny polka dots, but this came off of him years and years ago. I had a duplicate, but it got lost in my parents’ massive storage unit five years ago when our house was foreclosed. Ever since then I’ve been looking for another one. There is also a smaller version of this bear out and about as well.